With Father’s Day approaching we have been busy making cards at school and shopping for treats with Mum but also decided this year that it would be nice to make some gifts as well. Our first project was to make paper weights for our Dad’s desk at work. We found some nice chunky stones in the garden and put them in the oven for 40 minutes until they were REALLY hot. Mum took them out for us and put them on top of lots of newspaper and cardboard as this was going to get messy! We then touched old wax crayons to the top of then and watched as it melted down the sides. This created a lovely marbled effect all over the stone. We are leaving the stones to dry and will be writing messages on them- mine is going to say ‘My Dad Rocks’. This looks really nice and will make a great paperweight but if you decide to try be very careful and get an adult to help because the stones stay hot for ages and the wax also gets very hot when it melts. Our next project was to organise lots of chocolate into a present- rather than just making a hamper we decided to personalise it so we wrote a message and set out the chocolate to make part of it. 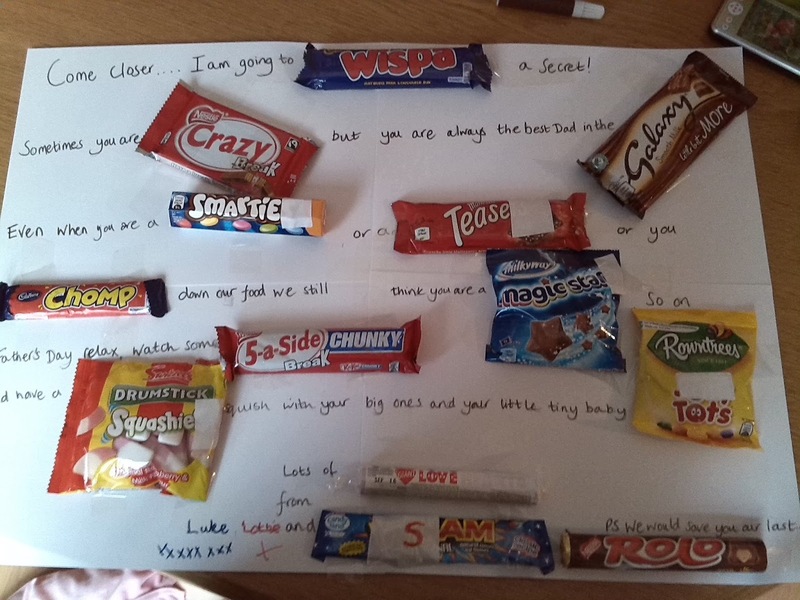 I think Dad will like this as it is quite a fun idea and more importantly involves lots of different types of chocolate. I wonder if he will share it? On Saturday Mum has promised we can make some cookies and we will decorate a nice box to put them in. I will post our recipe for them soon as they are really tasty! I just hope Dad decides to share his goodies or he will need a trip to the dentist with all these treats! p.s Sorry about the photos- Mum’s phone doesn’t have as good camera as Dad’s but I couldn’t borrow his for this without giving away the secret!